On Friday, Kanye West's massive Yeezy Season 3 Show in Madison Square Garden was totally upstaged by an intimate gathering of some of the world's best models, singers, and designers, in honor of Rihanna's collection with Puma. If you thought the singer's Puma creepers were a big deal, wait until you see her full line of clothing for the brand! After the show, the one question that was on everyone's lips was "where can you buy Rihanna's FENTY PUMA Fall/Winter 2016 collection?" 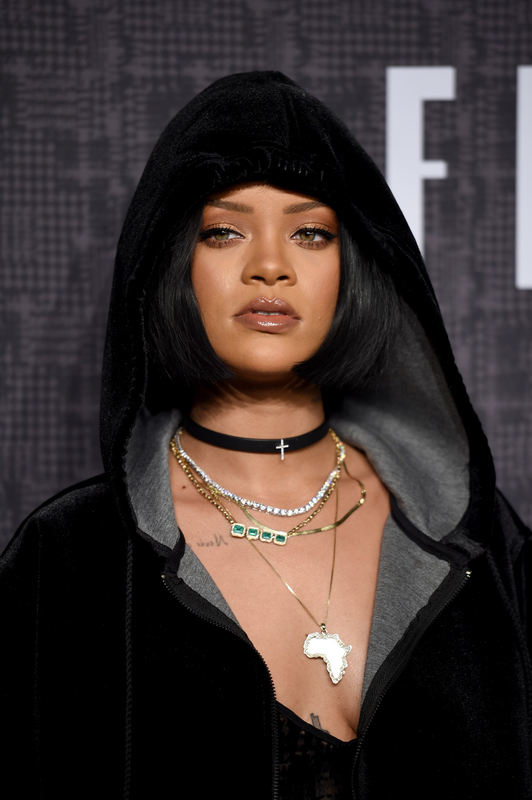 Rihanna was named creative director and brand ambassador for Puma late in 2014, and garnered much attention from fashion lovers after her major success with the forever sold out Creepers sneakers, so naturally everyone was looking forward to seeing what she brought to the table with an entire collection. Fortunately, fans were not disappointed. Rihanna's line included a black and white theme with patterns, prints, and textures that made every look versatile. The models sported lace-up sweatshirts, oversized hoodies, boxers, fur bomber jackets, platform Creepers, velvet dresses, and tracksuits. After the show, Rihanna told Vogue , “If the Addams Family went to the gym, this is what they would wear." Talk about athleisure goals! However, not all were impressed. The Washington Post titled it's review: "Rihanna wants you to dress like a genderless Japanese goth. And now you probably will." It seems like a fair assumption, but doesn't allude to the fact that musicians-turned-haute designers are a legit part of fashion history. I'd say that this is a step in the right direction for people to wear whatever the heck they want. Of course, I do have a bit of bias myself. Mix '90s goth with a little bit of athleisure and I'm your girl. I plan on keeping an eye on the Rihanna x Fenty collection, because I want to scoop it up before it all sells out faster than a Kylie Jenner Lip Kit. Vogue reports that the shoes seen on the runway will be made available to the public as soon as the end of the next month — and for less money than the famous Creepers! High Snobiety gives retailers and shoppers a collection release ETA of September 2016 for everything else. Your new fall 2016 wardrobe will most likely be found at PUMA locations and online at the PUMA website, before distributing to anywhere else.